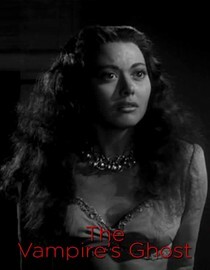 The Vampire's Ghost is a b-horror movie from the 1940's. It's a simple vampire flick set in Africa. One of the colonists happens to be a vampire. The natives of course know he's a vampire because natives are in touch with ancient evils and what not. A lot of it is pretty racist which I kind of expected. The natives were all painted up, dressed in loin cloths and talked exactly like Tarzan. Although you can tell from their tone of voice that they were really just some dudes from Brooklyn trying to make a buck. There is nothing really that special about this movie but it wasn't overly corny or anything either (except for the natives). The acting was decent, the story was OK, and they didn't try to do too much with special effects. It was entertaining enough but definitely not anything you need to watch. According to Netflix this movie will stop streaming on 7/15/13. Of course, sometimes they lie. Why is it in your queue? I thought the chic on the cover was hot. What stood out the most to you? The silly way the natives talked. What mood should I be in to watch this movie? Looking for an average b-horror movie from the 40's. Sorry, couldn't find a trailer for this one.